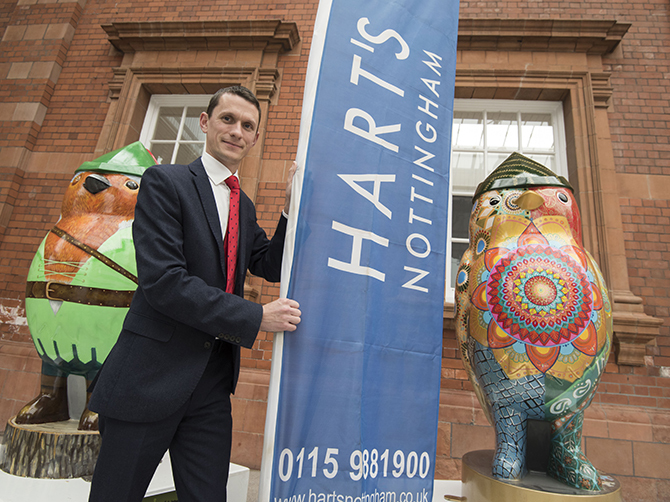 Hart’s restaurant and hotel is amongst the first sponsors to pledge support for Nottingham’s Hoodwinked public art trail, due to launch in the city in July 2018. “I knew straight away that I wanted to support this exciting project, which has the potential to bring so many benefits to Nottingham next summer. The picture shows Adam Worthington, General Manager of Hart’s Nottingham, with the first two sculptures to be unveiled. The Hoodwinked trail in Nottingham next summer celebrates the legend of Robin Hood – but with a mischievous twist on the tale. The sculptures transform our merry man in green into appealing robins – all based on an identical mould but each one unique, designed and painted by an artist. The free public art trail will run through the city from 7th July to 30th September 2018, bringing together businesses, schools and the community to boost the economic, social and cultural life of the city. Each sculpture will be sponsored by a business. Ultimately the trail will raise awareness and funds for Nottinghamshire Hospice, with an auction of the sculptures in October 2018. Hoodwinked is led by Nottingham City Council in partnership with Wild in Art, a leading creative producer of spectacular free public art events through the creation of uniquely-painted sculptures. Nottingham businesses are encouraged to sign up to sponsor a sculpture in celebration of our local legend and inspire their customers and employees to enjoy Nottingham’s creativity. There are also opportunities to support schools to join in with Hoodwinked through their own creative projects. More information is available from Caroline Elmhirst or Julie Walker at [email protected] or on 0115 8764984/5.